An Encounter With The Naga King Chillies | This Jaipur! All trades & hobbies naturally have their pitfalls for a novice. By happenstance I cook as a hobby & am also an admin for a Facebook group about food for the city of Jaipur. When a member procured some Naga King Chillies & offered to share some with the group members I naturally also asked for some. He kindly brought some over when he visited the Guesthouse for dinner one evening. You can imagine my apprehension when I saw that the jar in which the chillies came was pasted with a write up and also instructions on how to use them safely. Anyway I decided to use them in a very simple recipe of Junglee Maans. This recipe is from the book “Cooking Delights of Maharajas” by Maharaja Digvijay Singh ji of the princely house of Sailana. The recipe was intended for the use of the Shikari who would not have any measuring tools or the various comforts of the kitchen & would have very limited masalas at hand. So he uses only 5 ingredients mutton,whole red chillies,salt,water & Desi ghee or Oil. The measures are also approximate only. Instead of mutton I used 1/2 a Kg of Broiler & for the whole red chillies I put just ONE Whole Naga King Chilli in 250 gms of desighee with some salt. 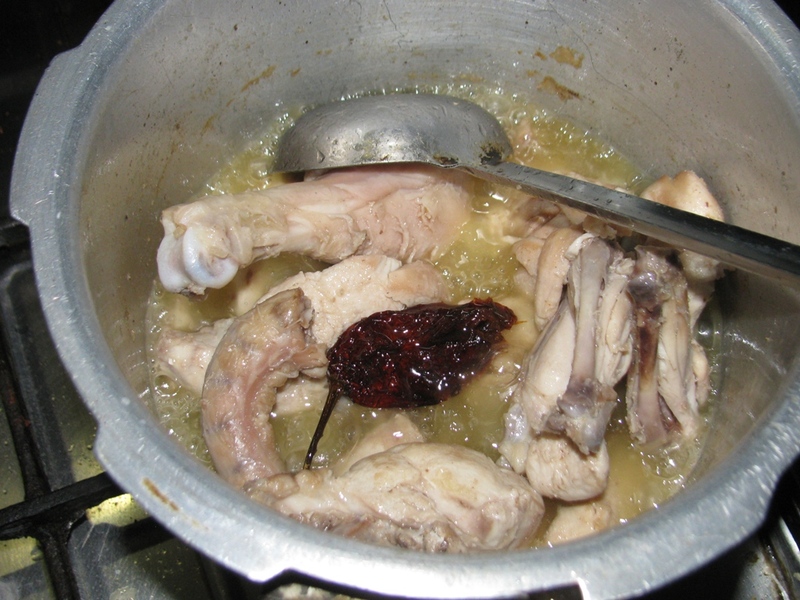 Later on I added little water at regular intervals to ensure that the chicken did not fry nor boil till it was cooked. When I tasted it the slight bite of the chillies came when I swallowed the chicken bite. Even if I say so myself it was a tasty preparation. Now, the trouble started because I underestimated the punch of the chillies( The Desighee had taken off the full bite of the chillies) & on the next day made the same preparation but with 3 Naga King Chillies & had the whole dish all by my self. Everything was fine till I finished eating, I could not get enough. But once I was through eating, my outer mouth area started burning. I drank copious amounts of water & ate large quantities of icecream, before things settled down. When I related my experience to my wife who had been away at an opening ceremony of a Spa at a famous hotel, she very kindly suggested for me to avoid taking any laxative that night! This entry was posted in Accomodation, Activity, cookery, GuestHouse and tagged chicken, cooking, hot, india, Naga Bhut Jolokia, naga king chilli, rajasthan, recipe, red hot chillies. Bookmark the permalink. What Is A 'Kos Minar'?